A new, weekly column (self-explanatory). 8/17/1984: Coach Pat Dye cites a lack of leadership at practice due to the extreme heat: “We didn’t get the kind of leadership out there on the field that we need to be a championship football team,” said Dye. 8/18/1993: The NCAA places Auburn on two-year probation stemming from allegations made by former player (and future romance novel cover model) Eric Ramsey: “Today is a sad day for our athletic program and an embarrassing day for our institution,” school president William Muse said. 8/19/2005: Quarterback Blake Field edges ahead of Calvin Booker in the race to back-up starter Brandon Cox. 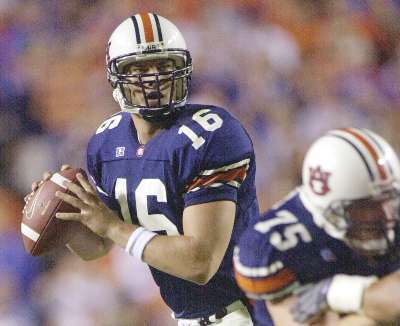 8/20/2002: Auburn coach Tommy Tuberville names Daniel Cobb the starter at QB when the Tigers face Southern Cal on Monday, September 2nd. 8/21/1982: Pat Dye says his freshman class is “the best looking group I’ve been around,” singles out Bo Jackson, Tommie Agee, and Steve Wallace. 8/22/1987: The Auburn Tigers start the season ranked No. 5 in the Associated Press preseason college football poll. 8/23/1973: Auburn trustees vote to rename the football stadium to honor Coach Shug Jordan. Cliff Hare Stadium will now be Jordan-Hare Stadium. Here’s video of the dedication.